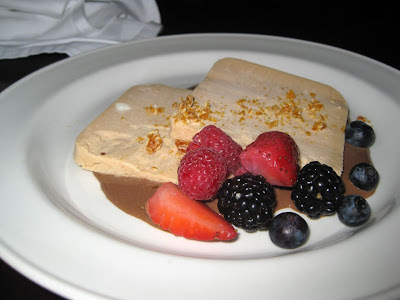 Le Select Bistro is widely regarded as one of Toronto's best French restaurants. For the quality of the food that you get, you'd expect to pay through the nose, which you surprisingly don't with Le Select. Is this how one of the patrons afforded the Aston Martin parked out front?... Well, maybe not. Le Select provides hearty French bistro fare at a reasonable price. The menu has relatively few items on it though, so we decided to try some dishes we normally wouldn't find at a typical downtown resto. 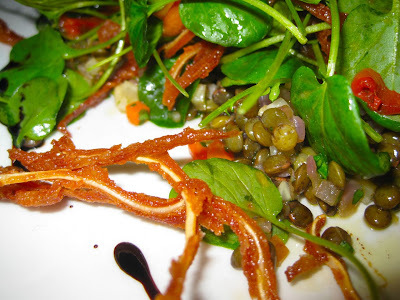 For les hors d'oeuvres, we had the Oreille de Cochon - crispy sow's ear strips served with lentils Du Puy from France's volcanic soils, and watercress; and the Tarte Nicoise - Provencal puff pastry tart with goat cheese, onion, tomato, olives and anchovies, served with an arugula salad. The sow's ears were exceptionally good! I've had porcine ears before, but not nearly as good as this. The strips were thin and perfectly crisp, an excellent contrast to the salad greens. The tart had a flaky crust and a subtle but rich goat cheese flavour. The bitterness of the arugula complemented the depth of the tart's taste very well. For mains we had the Joue De Boeuf Bourguignonne - beef cheek braised in red wine, with pork lardons and button mushrooms; and the Pave De Boeuf au Poivre - 8 oz centre cut filet, green peppercorn sauce with brandy and cream. The beef cheeks were very soft and mildly gooey. This piece of beef gets tops for texture and richness, but there were flavour notes missing that could be found in typical steak cuts. Luckily we had one on hand, and with some of the best fries we've ever had. The key to the frites appear to be balanced seasoning and peanut oil. Think Miss Vickie's fries! We finished off with Gateau au Chocolat - chocolate cake with Pure Caribe Cocoa and a passion fruit sorbet; and a Parfait Praline - frozen praline parfait served with a light chocolate sauce and almond brittle. I also had a cappuccino made with Maison Richard coffee from France (even the sugar was from France). The cake had a so-so torte texture, but was very chocolatey. The sorbet was wonderfully tart and refreshing, and went well with the chocolate. I really like the decor of Le Select. The tin ceiling by the bar, the old light fixtures and the tiled floors downstairs made you feel like you were in a sepia photo in Europe. The warm lighting added to that effect, no doubt. I loved that the signs to the washrooms read "W.C." i.e. water closet. They even got that small detail down.